The Legacy sits in the Ezzy line as the “more economically priced” sail range, targeted for wave and bump-and-jump in the smaller sizes and freeride in the larger sizes. In 6.5m the Legacy design is based on the Cheetah of old, streamlining the design with a more basic tack fairing and pulley, less of Ezzy’s signature integrated rigging guides and reducing the number of RBS epoxy battens used throughout the sail. That said, Spectra-X film is still used extensively in the sail’s panels for improved strength, and the new Legacy has been given a more “controllable feel across a wider wind spectrum”. Build quality is still very much apparent, so despite not having all the “bells and whistles” of the Cheetah, the Legacy is still certain to provide years of service. “The Legacy has everything you need and nothing you don’t need. The Legacy reminds me of the days when I was getting full-on custom sails built for competition, they had none of the marketing b.s. that people think they need but don’t really. 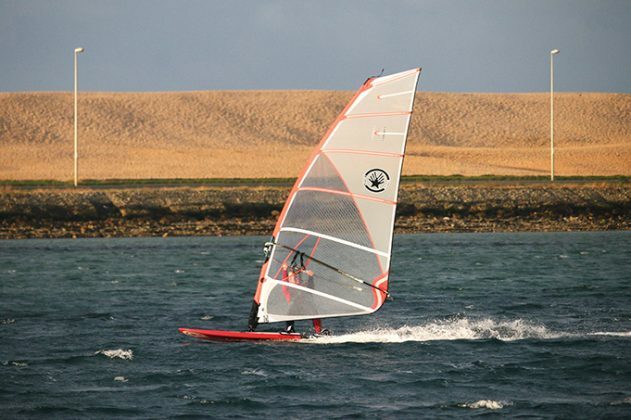 This sail is a classic Ezzy design, pure and simple.” – Kevin Pritchard. Rigged on a 430cm Ezzy Legacy XT 60% carbon mast, the Legacy 6.5m also has enough webbing extension in the head cap so that it’s capable of being rigged on a 460cm mast as well as SDMs. It sets with the trademark Ezzy deep profile thanks to the built in seam shaping, its power delivery fine-tuned extensively on the outhaul setting. On the water, this translates to a familiar feel, balanced in both hands and providing constant controlled feedback from the off. 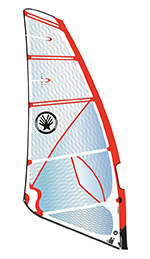 As a gust hits and pressure builds, the power can be delivered smoothly to the board, the sail filling and stretching to an even deeper draft. And this for the most part accounts for the difference between the Legacy and the Cheetah. There is a softness to the delivery in the Legacy, similar to that of past Ezzy sails – power comes on progressively, and is smooth and dependable. The Cheetah, on the other hand, benefits from David’s latest thinking in seam shaping, which along with full RBS battens, makes the delivery a little crisper, the wind range broader. But for many recreational sailors, the performance of the 6.5m Legacy here is more than ample. The centre of effort is placed low and forward in the draft, which combined with the sail’s low-cut foot, encourages the rider into a locked in and committed stance. As the wind increases, the sail can be retuned with more tension to settle any draft movement, the effort remaining locked forward in the draft. More straight-line blasting than manoeuvre-oriented in nature, the Legacy’s balanced handling nonetheless means that it can be used to enter transitions confidently, the power returning steadily as it is sheeted in on the new tack. Ezzy’s trademark quality and feel in a streamlined package and at £470 it represents excellent value for money.